The primary functions of government are to maintain order, settle conflicts, and protect the community. So I am told. Generally I am a small state man. In fact I refer to myself, when I don’t think anyone important is listening, as an anarchist. I believe that humans should be allowed as much freedom as is possible, without being allowed to seriously harm others. Rules and regulations and bureaucracy are not really my thing. So I am achingly reluctant to demand that the State gets involved in creating yet another agency, or add to its powers in any way. Where Governments around the world have to step in, right now, is to gain proper control of the creation of medical guidelines. Something that they have spectacularly failed to do, up to now. As you may be aware, a row is rumbling under the surface about European guidelines on the use of beta-blockers in surgical operations, guidelines that were based on corrupt research. Doctors following these guidelines have probably killed 800,000 people. Give or take. Some people have written into this blog stating that the numbers cannot be that high, and that the calculations are probably wrong. They were not my calculations, I hasten to add. My view on this is that many many thousands have certainly died unnecessarily. It doesn’t really matter if it was one hundred thousand, five hundred thousand, or eight hundred thousand. How many would be acceptable? The answer is, of course, none. But when guidelines go wrong the potential for killing hundreds, thousands, or even millions, is always there. If, for example, your guidelines state that fifty per cent of the population must take a drug for a condition, and these guidelines are wrong, you can kill millions,. 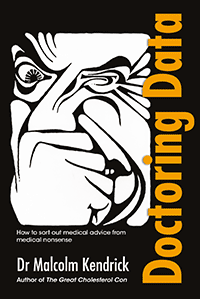 Recently, I did the back of a fag packet calculation on the number of people who were killed by the advice that patients must be managed with six weeks of strict bed rest after a heart attack. Here is some advice from that era: ‘The patient is to be guarded by day and night nursing and helped in every way to avoid voluntary movement, or effort.’ Thomas Lewis. According to my figures, and I am not going into them here, strict bed rest for six weeks after a heart attack killed fifteen million people worldwide. Yes, fifteen million. More than died in the fighting in the first and second world wars added together. This, I hope, gives you some idea of the potential death toll when medical guidance goes wrong. Given this, you would hope that the process that leads to the creation of guidelines would be checked, and double checked, then triple checked, then monitored. You would also hope that the evidence underpinning the guidelines was free from bias, and corruption. Furthermore, that all data – positive or negative – would be freely available, with no possibility of hiding anything away. You would also hope that those creating the guidelines had no possible conflicts of interest. The fact is that NONE of these things are true. We have a system that is almost perfectly free from scrutiny of any sort. Many, if not most, guidelines are based on trials that are designed, set up and run by the pharmaceutical companies. They own and control the data, and are under no obligation to let anyone else see it, if they don’t want to. Negative data are regularly buried, never to see the light of day. A few brave souls e.g. Ben Goldacre, Fiona Godlee (editor of the BMJ), and Peter Gotzsche have been demanding that all clinical trial data are made available for scrutiny, but almost nothing has happened. Currently Roche are refusing to release data on their flu drug Tamiflu. Various studies remain unpublished, no data released. The UK Govt. seems powerless to act. Or maybe it just doesn’t want to, with so much money at stake. Last year AbbVie and InterMune, two drug companies, took legal action against the European Medicines Agency to stop them releasing any data from clinical studies, and to ensure that no trials data could made available, anywhere, to anyone, ever again. I like to think I helped to kick this monstrous and terrible legal action into touch. But, companies still do everything in their power to ensure that data will not, ever, be released. Dr. Cleeman: (Chairman) has no financial relationships to disclose. Dr. Grundy: has received honoraria from Merck, Pfizer, Sankyo, Bayer, Merck/Schering-Plough, Kos, Abbott, Bristol-Myers Squibb, and AstraZeneca; he has received research grants from Merck, Abbott, and Glaxo Smith Kline. Dr. Bairey Merz: has received lecture honoraria from Pfizer, Merck, and Kos; she has served as a consultant for Pfizer, Bayer, and EHC (Merck); she has received unrestricted institutional grants for Continuing Medical Education from Pfizer, Procter & Gamble, Novartis, Wyeth, AstraZeneca, and Bristol-Myers Squibb Medical Imaging; she has received a research grant from Merck; she has stock in Boston Scientific, IVAX, Eli Lilly, Medtronic, Johnson & Johnson, SCIPIE Insurance, ATS Medical, and Biosite. Dr. Brewer: has received honoraria from AstraZeneca, Pfizer, Lipid Sciences, Merck, Merck/Schering-Plough, Fournier, Tularik, Esperion, and Novartis; he has served as a consultant for AstraZeneca, Pfizer, Lipid Sciences, Merck, Merck/Schering-Plough, Fournier, Tularik, Sankyo, and Novartis. Dr. Clark: has received honoraria for educational presentations from Abbott, AstraZeneca, Bristol-Myers Squibb, Merck, and Pfizer; he has received grant/research support from Abbott, AstraZeneca, Bristol-Myers Squibb, Merck, and Pfizer. Dr. Hunninghake: has received honoraria for consulting and speakers bureau from AstraZeneca, Merck, Merck/Schering-Plough, and Pfizer, and for consulting from Kos; he has received research grants from AstraZeneca, Bristol-Myers Squibb, Kos, Merck, Merck/Schering-Plough, Novartis, and Pfizer. Dr. Pasternak: has served as a speaker for Pfizer, Merck, Merck/Schering-Plough, Takeda, Kos, BMS-Sanofi, and Novartis; he has served as a consultant for Merck, Merck/Schering-Plough, Sanofi, Pfizer Health Solutions, Johnson & Johnson-Merck, and AstraZeneca. Dr. Smith: has received institutional research support from Merck; he has stock in Medtronic and Johnson & Johnson. Dr. Stone: has received honoraria for educational lectures from Abbott, AstraZeneca, Bristol-Myers Squibb, Kos, Merck, Merck/Schering-Plough, Novartis, Pfizer, Reliant, and Sankyo; he has served as a consultant for Abbott, Merck, Merck/Schering-Plough, Pfizer, and Reliant. Those companies that I have marked in bold sell (or at the time sold) statins and/or other cholesterol lowering medications. A mere eight members (the chairman was employed by the NIH who was not allowed close ties with industry), and we have almost seventy direct financial conflicts of interest with companies who made, and sold, cholesterol lowering agents. How we can possibly allow doctors with enormous financial conflicts of interest to create guidelines that will be followed around that world, and will affect hundreds of millions (in this case billions) of people….How can this possibly be allowed. The fact is that none of these critical requirements are followed….even remotely. How many other guidelines out there are wrong, damagingly wrong, and horrifyingly wrong? How many millions of people are being put at risk by a system that is wide open to corruption, and bias? I have not the slightest idea, but I suspect many…. 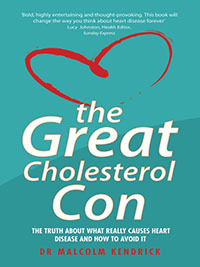 This entry was posted in Dr Malcolm Kendrick and tagged AbbVie, Ben Goldacre, beta-blockers, cholesterol, community, European Medicines Agency, Fiona Godlee, InterMune, operation, Peter Gotzsche, pharmaceutical industry, Roche, surgery, Tamiflu, Thomas Lewis on January 29, 2014 by Dr. Malcolm Kendrick.